PHOENIX – Isaiah Whiteside first went to jail at 16. That point in his life didn’t have any meaning, he said, which led to boredom and then trouble. As a young person not in school and without a job, Whiteside fit the definition of a disconnected youth. So did Richard Martinez-Teller, a 15-year-old who already knows what it means to be hungry and begging for money on a street corner. As of 2012, the Phoenix area had an estimated 183,000 disconnected youth, and the Valley’s percentage of disconnected youth – 22 percent – ranked it worst among the nation’s 25 most populous metropolitan areas, according to Measure of America, a social science research group. 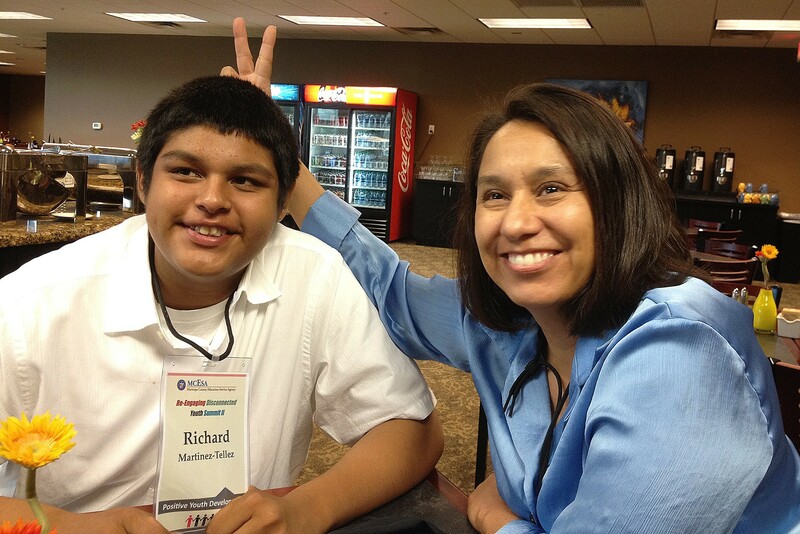 Whiteside and Martinez-Teller, who both speak of their lives in terms of before and after, recently addressed the second Maricopa County Education Service Agency Disconnected Youth Summit, which drew leaders including Phoenix Mayor Greg Stanton. Stanton said the Valley’s large number of disconnecting youth translate to huge economic and societal losses for all citizens. Stanton cited a study by the Arizona Mayors Education Roundtable showing that the social loss for a disconnected youth is $695,090. Kristen Lewis, co-director for Measure of America in New York, has been tracking disconnected youth throughout the country. When the first report came out in 2012, she said, the biggest surprise was how few people knew about this part of their community and the biggest challenge was making the public aware of it. Lewis had high praise for what Phoenix has done to address the problem. “Phoenix is different because it really responded to the report in 2012. So now Phoenix is fourth from the bottom,” she said. Phoenix held its first disconnected youth summit held in May. The second, held Oct. 15, focused on the best ways to re-engage disconnected youth. A final summit in February will identify any gaps in the system and propose solutions. Kristene Morris, chief deputy superintendent of the Maricopa County Education Service Agency, said that disconnected youth are a symptom of a disconnected system. Her office is working to make sure kids don’t fall through the cracks but to provide an easy way to get back if they do. “We have made it very easy to get out of school but very hard to get back in and if we start to connect our social services we think we can make it easier to re-engage,” she said. Superintendent Don Covey said the Maricopa County Education Service Agency did a lot of research on communities like Philadelphia and Boston that have track records for re-engagement. “Our goal is that if we can cut the disconnected youth in the next five years working on a collective impact model from say 180,000 to 90,000 we will make the impact 50 percent greater for that population and reduce social cost,” Covey said. Whiteside no longer considers himself one of Arizona’s disconnected youth. Preparing to start community college in December and hoping to become a journalist, he said that change in direction came after a lot of support and some personal reflection. “Somebody can only tell you so much, but you have to realize it yourself and think about what it is that you want to do and you know you gotta make that step to tell yourself that you don’t want to be in trouble for the rest of your life,” he said. Martinez-Teller still relies heavily on the support of Maricopa County Education Service Agency programs and said he is working to stay sober and finish high school. But he’s pleased with his progress. Richard Martinez-Teller, left, and Norma Hernandez, the transition facilitator helping him re-engage as a disconnected youth. Martinez-Teller is working on receiving his high school diploma. 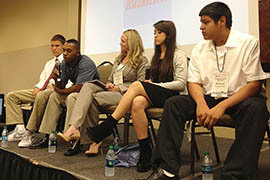 From left: Former disconnected youths Daniel Kier, Isaiah Whiteside, Olivia Baldassini and Richard Martinez-Teller, with volunteer coordinator Shelly Carr in the center, take part in a panel discussion at the Maricopa County Education Service Agency's Disconnected Youth Summit.